I found the recipe for this homemade pineapple cake while I was flicking through the 4 Ingredients cookbook. 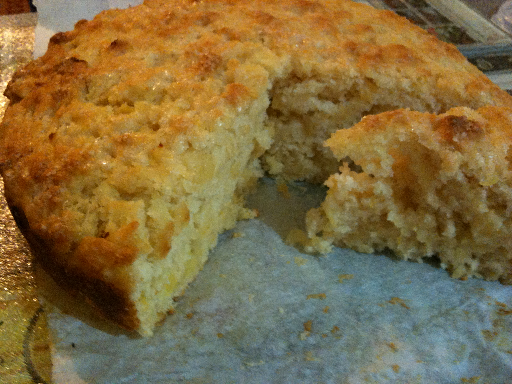 The pineapple cake recipe was so quick and easy I decided I had to make it. I quickly trotted off to the supermarket got my can of pineapple made the pineapple cake first then cooked dinner and had dessert to eat at the end of the night. Now that is my idea of a quick and easy dessert. It has a bit of a funny texture but is delicious. The original recipe calls for 1 cup of sugar but I thought it was too much so used half but I recommend a bit more. It's all trial and error. For a bit of decadence I recommend a chocolate icing. It's divine but very wicked. If you can just stick to the pineapple cake on it's with a little Milk Free Butterscotch Ice-cream, I suggest it best. Mix flour and sugar in a large bowl. Add pineapple with juice and mix. Bake in a lined cake tin at 180 degrees for 35 minutes. 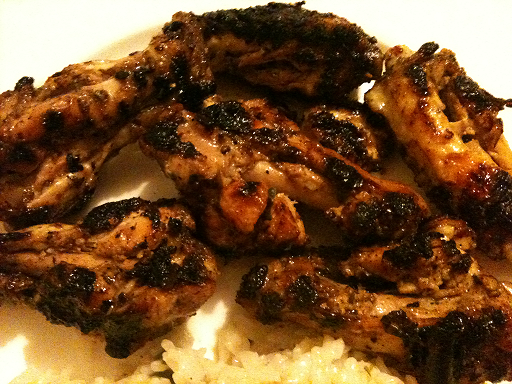 This is a Jamie Oliver recipe for Jerk Chicken. Actually it's his friend's Levi but I have changed it a bit to suit what I had in my pantry. This is now my favourite jerk chicken recipe, it is absolutely delicious. Just make sure you have all the doors and windows open when you make this because it will smoke out everything set your fire alarm off and the smell will stick to your furniture for quite a few days. But let me tell you it is all worth it! Or you can just make this outside on the BBQ instead of your griddle pan in the kitchen! In a bowl mix Allspice, peppercorns, chilli flakes sugar and honey. Then add the parsley, garlic and ginger to the spice mixture. Add the green parts of the spring onions and a good drizzle of oil and mix well. Pour the marinade over the chicken and massage it in. Leave to marinate in the fridge for at least 1 to 2 hours, but preferably overnight. (I highly recommend overnight if you can wait the flavour is incredible). Place the chicken, skin-side down, on the pan or barbecue over a medium heat and cook for 30 turning often, or until the chicken is golden and cooked through. When the chicken is ready, squeeze over a little lime juice, then take off the grill ready to tuck in. You could also cook this in the oven at 200°C/400°F/gas 6 for 25 to 30 minutes, turning occasionally, then finish them off on the barbecue for 5 minutes to get all lovely and charred. In a pan over medium heat stir brown sugar, butter and vanilla for 3-4 minutes until butter melts, sugar dissolves and mixture is bubbly. Pour in ½ cup rice milk and whisk until smooth, then remove from heat. Set aside. Mix remaining 2 3/4 cups rice milk in a saucepan and cook over low heat. Once mixture begins to boil, remove from heat anf immediately add arrowroot cream. This will cause the liquid to thicken noticeably. Add butterscotch mixture to cream and whisk gently. Refrigerate under chilled approximately 2-3 hrs. Freeze according to ice cream makers instructions. 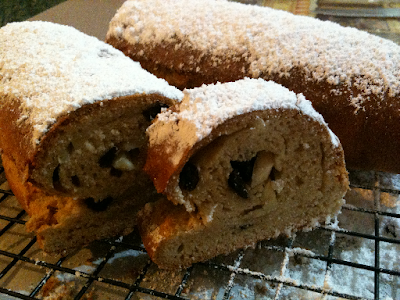 I found this Stollen recipe in the latest Coles magazine with recipes by Curtis Stone. It is their Christmas edition. 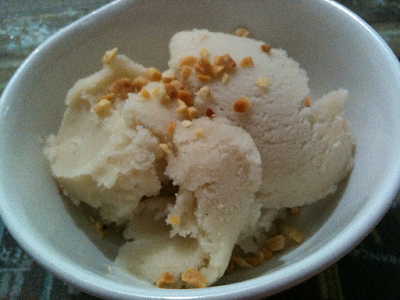 I have halved the recipe and changed all dairy products to milk free products. I made it to use up some sultanas and nuts that I had in my cupboard but you can add more if you choose including mixed peel and currents. 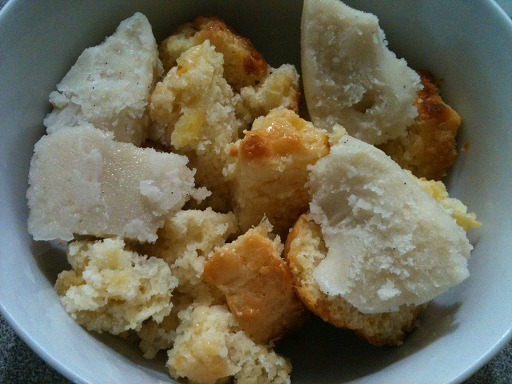 Combine milk, sugar and yeast in a jug and leave to stand for 10 minutes until frothy. Sift flour and spice into a large mixing bowl and stir in extra caster sugar. Make a well in the centre. Add milk mixture, margarine, egg and vanilla essence to dry ingredients and use a wooden spoon to combine. Gather dough together with your hands and turn out onto a lightly floured work surface. Knead for 10 minutes until dough is smooth and elastic. Place into a lightly oiled bowl, cover with plastic wrap and leave in a warm place for 1 hr or until doubled in size. Preheat oven to 180C. Line a large baking tray with baking paper. Turn dough onto work bench and press out about 2cm thick. Sprinkle fruit and almonds over and knead briefly to combine. Roll the dough to an oval shape, about 28cmx18cm. Starting at one long side, roll into a log shape and place onto prepared tray. Bake for 30 minutes or until golden brown and hollow sounding when tapped. Transfer to a wire rack to cool. Dust generously with icing sugar.